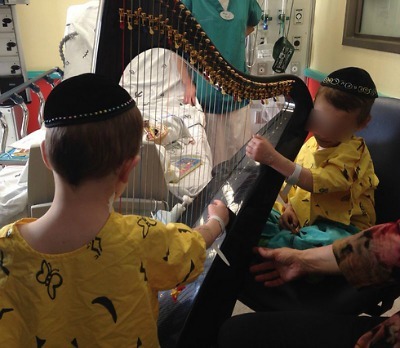 B”H, Yitzchak and Michael Gross’ condition has improved so much they have been released from the ICU to the regular hospital ward (in this photo, the brothers are playing a harp with the hospital’s music therapist). 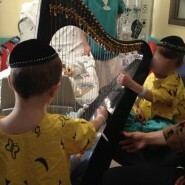 The Gross brothers playing harp with music therapist this week at the Schneider Children’s Hospital. Yitzchak and Michael are still receiving medicine orally, and will need to continue rehab, such as physical therapy to strengthen their weakened muscles. But b”H, otherwise, doctors say they are doing well and should be released from the hospital sometime over the next few weeks. Let’s remember this story next time we despair and think there is no hope…we will remember the Gross brothers and be reminded that prayer really does work and that Hashem can do ANYTHING! Chasdei Hashem ki lo tamnu! What great news! May Hashem give the boys koach to continue getting better. May Moshiach come now so that all the sick get better and we all recognize the greatness of HaKadosh Baruch Hu. Question: Do we continue davening for Rafael Yitzchak Isaac ben Michal and Chaim Michael Shlomo ben Michal or do we eliminate the names Rafael and Chaim as they are no longer in danger for their lives? Please let us know. I asked this question after my grandmother died, and a rav told me that if the person gets better, then it means the name change “stuck”, so that is their new name. Otherwise, like in Rav Ovadia’s case, the appended name is dropped because it never “stuck”. amazing and heartbreaking at the same time. So sad for the loss of their sisters. B”H these boys are alive and healing. What a crazy story. We need Moshiach now. to hear good news.Sending strength to the parents. Thank you so much for the continual updates – it’s so hard to follow on the news and am constantly thinking of them! Thank you for sharing the good news. Keep it coming B’ezras Hashem. I also want to thank you for posting this good news. I’m davening for them everyday and was so happy to see that they’re so much better BH. May Hashem comfort the parents. We really want Moshiach now!